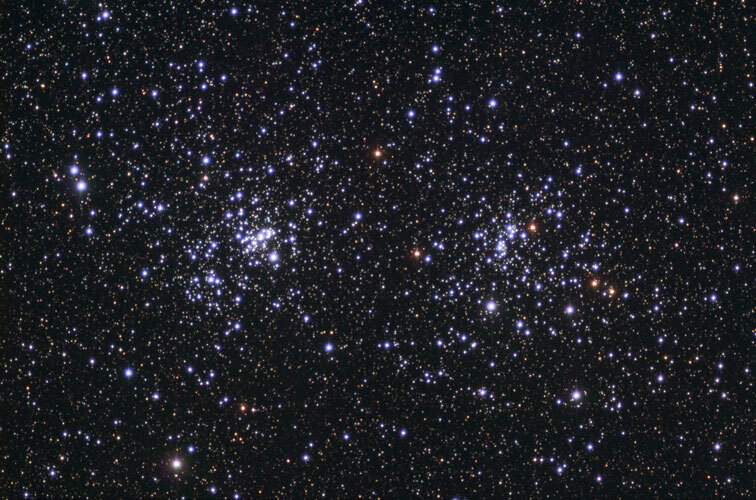 The Double Cluster is easily visible to the naked eye even from moderately light-polluted locations. It makes a beautiful sight in a telescope of any size, and is downright stunning in a moderate-sized telescope equipped with a wide-angle eyepiece. It is one of my favorite deep sky objects, along with Omega Centauri and M42. NGC 869, also known h Persei, is on the left, with NGC 884, also known as chi Persei, on the right. They are both located at a distance of 7000 light-years, and are very young for star clusters, NGC 869 being 5.6 million years old, and NGC 884 being 3.2 million years old. Technical Notes: Individual exposures were dithered with CCDAutoPilot and sigma combined. The RGB image was created in Registar 1.0. Unsharp Mask was applied at 100% to the brighter portions of the luminance image with a radius of 1 pixel and a threshold of 0. Gaussian Blur of 1 pixel was applied to the RGB image.